Blackjack tables at casinos usually have a betting range posted somewhere in plain sight. A common example is from $5 – $2,000. The game will go quickly. Unless you are a Saudi prince, a good beginning bet is the minimum. A hand is referred to as hard or soft. If you have drawn a six and a seven you have a “hard” thirteen. There’s nothing else it can be. However if you draw a six and an ace, you have a soft hand and a lot to think about. You have either seven points or seventeen depending on what you say it is worth. You can ask for another card. You certainly won’t go bust. If you draw a king you can say your ace is worth just one point and you hand totals just seventeen. If you draw a four – wow! Your ace is worth eleven and you just hit twenty-one. Check to see what the dealer does. He stands. That means his cards are worth seventeen or better. There’s a good chance it might a better hand than yours. No problem. Draw another card. Pits! You’ve drawn a ten. Now you must count the ace as a one and your whole hand is worth seventeen points. The dealer has seventeen points or better. If he has seventeen, you tie. With a tie, you get to keep your bet but you don’t make any money. You didn’t come to keep your bet, you came to gamble. You know that chances are better you will draw something worth more than that four you need to win, but chances are also good that the dealer has a better hand than yours and you’ve lost your bet anyway. Go for it! You ask for another card. It’s a three. You have twenty points. The dealer flips his face down card over and reveals a hand worth nineteen points. He shoves $5. in your direction and prepares to deal again. You let out your breath. You were right. If you had stood at seventeen, you would have lost. Blackjack is one of the most popular casino games in the United States. In this article, I want to give a quick rundown of the game for those that might be new. I will keep things very simple. In other articles, I will explore the game further. Are you ready for a lightning fast primer to the game of Blackjack? Let’s get started. First, you need to know that each card is worth the value printed on it. For example, a Two of Clubs is worth two points. An Ace can be one or eleven—your choice. Face cards are worth ten each. If you are holding a face card and a seven, you have 17. Simple right? All bets pay even money with the exception of Blackjack, which pays 1.5 to 1. A Blackjack is a face card and an Ace and only occurs when your first two cards dealt are these two. If, for example, you bet $10 and received a Blackjack, you would win $15. There are modifications of Blackjack that have other side bets, but we won’t get into that here since those are more of a carnival attraction. Blackjack is played at a table with at least you and the dealer. You don’t need other players at the table, but it can be fun to have others to talk to. The hand starts with the dealer dealing one card to each player—starting from the dealer’s immediate left. The dealer will flip the first card over for all to see. The dealer then deals one more card to everyone—so you start with two cards. The dealer’s second card is tucked under the first so it can’t be seen. Once the cards are dealt, play begins. The player on the dealer’s left goes first. The game progresses clockwise, and the dealer plays last. Note: Bust or Busting is when you go over 21. If you do this, your hand is over and you lose. Stand: If you love your first two cards you can stand, which means to pass. If you decided to take cards, you will come to a point where you will want to stand, unless you bust. Hit: If you want another card, you take a hit. You can hit as long as you like—as long as you are not over 21. Double Down: You have the option of doubling your wager and taking one final card. 11 is a popular double down hand in Blackjack. Split: If you have two cards of the same rank, like two 8’s, you can split them to form two separate hands. Splitting your hand costs extra money.You will need to double your previous wager. For example, if you bet $10 and received two 8’s, it would cost $10 more to split them. Surrender: This option is available at some houses. When you surrender, you quit the hand and lose 50% of your wager. Some people like to surrender when the dealer is showing a high card and they have bad initial cards. Insurance: If the dealer has a possible Blackjack, insurance will be offered. By making an insurance wager equal to 50% of your initial bet, you can get all your money back if the dealer has Blackjack. However, if there is no Blackjack, you lose your insurance bet. Most pros will tell you that it’s a sucker play—including me. You are now up to speed with the basics of Blackjack. I told you it was quick. Your next step is to continue reading to go deeper in the game. Remember, playing and winning are two different things. To win over the long term, you need to understand the game completely. Historically, the origin of the game of blackjack is disputed. 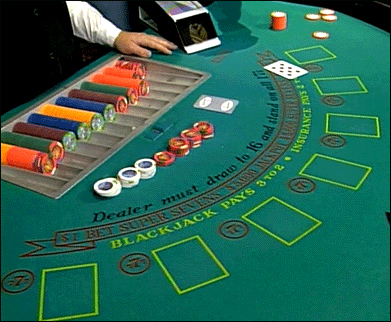 The game of blackjack is claimed to have drawn its roots from a variety of card games. Some people believe that blackjack evolved from a French card game whose name translates to mean twenty-one, while others suspect blackjack’s family tree goes back as far as the Italian game of thirty-one. Regardless of where the game of blackjack came from, the fact remains that blackjack is amongst the most popular casino games online. The game of blackjack became one of the best games for professional gamblers, as one can reduce the casino or house’s edge by taking a strategic approach to the game. Blackjack is a math-based game and players can play optimally in order to cut down and even eliminate the edge the house holds over the players. This means that players can play “smartly” in order to beat the game consistently. One of the pioneers of early blackjack strategy is Dr. Edward Thorp. Thorp revolutionized the game of blackjack by utilizing an IBM PC to further the understanding of blackjack strategy and even card counting. 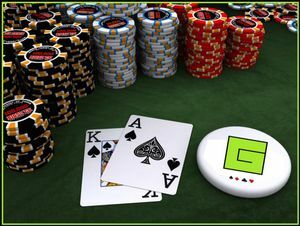 Due to Thorp’s work, online blackjack players and live blackjack players were able to use information provided by visible cards in order to determine whether the blackjack shoe contained mostly high cards or mostly low cards. This information tells the astute blackjack player whether hitting is in their best interest or standing is in the cards for marginal situation. Today, blackjack is played and enjoyed by novices, hobby level players, and professional blackjack players alike. The game of blackjack can be played in most casinos that offer card or table games. Additionally, the Internet variation of blackjack (known as online blackjack) can be enjoyed by players of blackjack online at almost any reputable Internet casino. If you can count to 10 then you can make money at the blackjack table when playing through your Unibet bonus. With a bit of time, dedication, and knowledge you can learn to count cards and make more money from blackjack than you ever thought possible. Of course, as with all things in the gambling world, learning how to count cards isn’t easy. In fact, it’s fair to say that card counting is one of the trickiest gambling strategies you can try and master. One of the main reasons that card counting is difficult to master is that everything inside the casino is stacked against you. At its basic level card counting is a relatively simple process: every time you see a card between 2 and 6 you add one to your running count, every time you see a card between 10 and ace you subtract one from your count and if you see a 7, 8, or 9, you do nothing. This process continues for a number of hands until you divide your running total by the (approximate) number of decks left in the shoe. This process gives you your true count and lets you know whether the deck is in your favour (contains a high percentage of tens) or against you (the deck contains a lot of low cards). If you’re relatively proficient at mental arithmetic then this strategy won’t be too hard to get your head around. However, theory is always easier than practice because once you sit down at the blackjack table things get a lot harder. The speed of the dealer, the noise of the casino and the constant calling of numbers are all designed to interrupt your count. In turn this can affect your whole strategy, because even if you’re wrong by the smallest margin you can lose a lot of money. Indeed, making a mistake whilst card counting will likely cause you to lose more money than if you hadn’t tried it at all. If you want to make more money from blackjack, then card counting is a great way to do it. However, you need to make sure you master the technique properly otherwise it will be more of a hindrance than a help. Going pro is something that entices a lot of blackjack players, but can it really be done? That’s something on the minds of many people. When you know that you want to sharpen your skills, having a goal really makes sense. You don’t want to find that you can’t reach a goal that you’ve set, so this guide is definitely for you ambitious types out there that really want to make sure that you’re going to be diving deeper into the world of blackjack. We’ll warn you quickly — this type of blackjack isn’t for everyone. You will find that you have to play a lot of blackjack to even think about going full time. This is because you have to count on your skills in a way that most casual players don’t have to count on them. As long as you’re thinking in this vein, you’ll be just fine. It’s often the people who think that they’re not going to have to think this way that end up suffering the most. Our opinion is that if you aren’t winning very much in blackjack online, you will ultimately not be able to carve out a space as a professional blackjack player. Not only do you have to be able to win, you also wouldn’t do wrong learning how to count cards. This is a subject that’s a bit outside this guide. Learning how to count cards in blackjack isn’t the easiest thing that you will do, but it’s definitely something that’s worth it. The more practice you put into it — especially with multiple decks in the shoe — the better off you will be. Most guides talk about playing blackjack offline, but there’s nothing that’s stopping you from playing online blackjack this way. You will need to make sure that you’re not deviating from blackjack strategy. Even in live dealer casinos online, you’re going to be hard pressed to win anything if you can’t get this part right. Basic bankroll strategy is also a must. When you’re winning, you need to bet more. When you’re losing, you need to cut back. However, you don’t want to draw attention to yourself, even online. This gives people incentive to mess with you or try to throw you off. You want to raise your bets up slowly so that you have a fighting chance of keeping your money. Casinos reward loyalty, but all casinos tend to think poorly of card counters. While it’s not cheating if you use your own brain power, it’s still taking profits away from the casino. It really becomes a matter of numbers. The more hours that you play, the lower your average bet needs to be. You’ll have an edge over the house, but don’t let that get you too comfortable. You really have to make sure that you are playing the best blackjack at all times. Sometimes that means you’re going to have to make some pretty tough decisions. Is this something that interests you? Really, really, really, interests you? You might find that you’re going to be spending a lot of time just making everything fit together. This isn’t something for a newbie to dream about — not without a lot of hours of work. Some people overlook that, to their detriment. You need to make sure that you’re always thinking about the bigger picture when you want to turn yourself into a professional blackjack player. It’s all part of the game. You don’t want to assume that you’re never going to lose either — that’s a recipe for a disaster. Most pro blackjack players are incredibly humble and they’re not afraid to make tough decisions if it means that they get where they’re trying to go. Good luck! These terrific bonuses form the backbone for regular bonus chasers. They are valuable opportunities and need to be handled tactfully and with finesse. The last thing any bonus chaser wants is to be bonus banned from one of them because his behaviour needlessly alerts the casino to review his account. Remember the sosphisticated software that all online casinos use gives them fantastic information about all of their customers. Only the casinos themselves know the exact criteria that are used to classify some players as bonus abusers and restrict bonuses from them. Unfortunately they are hardly likely to tell us what these are.What we need to do is blend into the mass of ordinary players. Try to appear as a small scale player who just got lucky. One of the few that benefited from positive variance. Don’t deposit, crash through the wagering requirements and withdraw all in one visit. Nothing will hide from the casinos the fact that you are withdrawing more cash than you are depositing. But there is no need to wave additional red flags at the casino. If I was running a casino I would look at the betting pattern of all the accounts with this characteristic. Anyone attempting to hit and run would get banned pretty promptly. Only one casino has banned me after I have done the initial bonus (www.bethedealer.com). Everytime you withdraw money your account may be scrutinized. You can reduce the number of withdrawals you make from an account using a tactic sometimes referred to as “double dipping”. This involves waiting until the end of a month before depositing and then depositing again at the start of the next month. Once you have finished the wager requirements for both months you remove all the money in one go. This also minimizes the withdrawal fees that casinos sometimes charge. My bankroll now allows me to keep money in my accounts for several months at a time before withdrawing it. If you have a losing run or the dealer hits three blackjacks in a row, stop playing or move to another table. Play on the multi-player tables if they have them and chat to the other players. Don’t insult their play however or bad mouth the casino. You won’t score any points for that type of behaviour. I particularly look out for empty multi-player tables or tables with only one other player because otherwise the rate of play is just too slow for me. This is discussed endessly amongst the bonus-chasing community and refers to action given to the casino after you have met the minimum wagering requirements for a bonus. This is an attempt to fool the casino into thinking that you are a regular punter. The problem here, as I see it is that all cover play both reduces your profitablity and increases the time required. I personally don’t think it is worthwhile. I prefer to break down the wagering requirement into 8 or 9 parts and visit the casino several times over each month. If you are counting your bets then don’t make bets of exactly 100 units each time as this will definitely look unnatural. I generally play 5% or 10% over the minimum wagering requirements for each bonus. 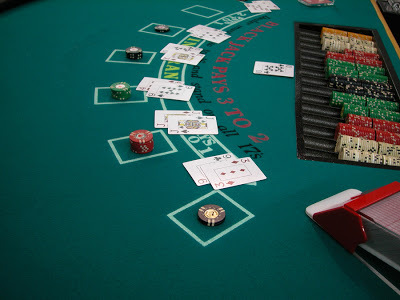 Black Jack is one of the games that is played in the entire world and also known as Twenty-one. It is a game of comparing cards. It is one among the top most casino games played. Players should be clear on the game of Black Jack. They will not win if their points are much close to 21. They win only if they have more points then their opponents. The player many times wins with a score of 12 or 13. Many players think that the face down card of the dealer would be 10. But that is totally wrong assumption by the players. It is known to every body that there are only 4 10’s in a set of playing cards. That means that dealer have more chances of getting other cards apart from 10. Players should not have any wrong assumptions on the game. Use your logic and play the game. Few players think that card counting would help them to win the game. That’s not actually true. The outcome on counting the cards is not fixed all the time. It varies mostly. It can help you if are an expert. It’s better for the beginners not to use this rule as they might loose money. Card counting can only understand if he keeps on playing. The knowledge on counting cards can be gained gradually. If a player plans to take insurance in the initial stage of the game, then he should give 15 % of his pay to casino. That proves that claiming for insurance in the game of Black Jack is a bad idea. Players who have confidence that they can make money usually think of claiming for insurance. But the suggestion given by many people is not to take insurance. A player who plays the worst affects the entire game. A player performance in the game is totally dependent on him. This usually does not happen. Its just a wrong thinking by the players. Since the birth of the Internet, all aspects of mankind’s life underwent a paradigm shift. Same has to be said about gambling. One of the biggest and most lucrative industries in the world shifted from the traditional avatar into the web domain as virtual casinos. Within a decade, online gambling sites were a rage amongst billions of people round the globe, furnishing a wide array of casino gaming options and services. Several casino sites are famous for providing unique and exclusive casino experience, with the use of modern software, detailed graphics, advanced technology and realistic sound effects. But not all gambling sites are trustworthy and genuine; some try to fool the customers and players by offering exceptionally high bonuses, and making big claims. These are the sites that you should avoid to save your hard-earned money. In order to identify such fake and fraudulent gambling websites, you should go through casino reviews. These reviews are crafted on various parameters, which include gaming atmosphere, technology, customer care and game play options. Casino sites which can deliver the goods and keep the players satisfied generally perch at the top half of the list. These are the ones which are safe and apt for online gambling. Casino gaming is no more restricted to the famed casino centers of Las Vegas and Atlantic City. Gone are those days when people needed to travel half way round the globe in order to experience the thrills and excitement of a live casino. With the availability of Internet, one can indulge in his/her favorite casino games and services, right from the drawing room, without even treading an inch. Online casinos are a rage these days amongst billions of players and gamers throughout the world. Equipped with realistic sound effects, detailed graphics, and casino bonuses, online casino sites are the hotspots of gambling of the modern world. There are several benefits associated with online gambling sites, which makes it a huge hit amongst the mass. First and foremost, you can dabble in a wide array of gaming options and services, which are available in both paid and free avatar. So, if you are interested in free blackjack or Paid Poker, you just need to register with a website that offers these games. Then there are no constraints related to time or location with online casinos. You can indulge in online gambling as and when you want. Besides, the reward scheme is quite lucrative to keep the players encouraged and motivated. Blackjack tournaments have been established in the States for some time but are gaining popularity elsewhere all the time. All the players start with a fixed number of chips and the dealer plays out a predetermined number of hands. The winner is the person who has accumulated the largest stack of chips at the end of the game. Whether you are ahead of your initial stake or not is irrelevant. So the key principle involved isn’t whether or not you beat the dealer, it is how you do relative to the other players. This introduces a new level of strategy into the game. In live play, tables are often 6 handed with only the winner or top two advancing to the next round but online most games are played heads-up. Win three or four games and you are in the money. Here I win a 10 BJ freeroll and collect a first place prize of 40. These tournys are held all the time and have absolutely no entry qualifications! This particular tournament was limited to 256 entrants but actually only attracted 111 people. If this works, great: if not, then lump it all in at the end. Bet half your stack and then double or split depending on your cards (and cross your fingers). The balance on my a/c is $104.50. All won from freerolls and I decide it is time to cashout. I go to the website but can’t find the withdrawal option. Well, gaming sites often hide this page away somewhere (after all, they prefer you to just carry on playing). So, I am not bothered by this. I just email customer services and ask for help. I get a reply the next day stating that I must make a deposit before I can withdraw my winnings. This is not unusual. I know several poker sites that ask you to do this. I make the minimum deposit allowed and immediately request the whole amount to be put back into my back into my bank. This is where I become slightly annoyed. The software won’t let me withdraw my deposit, only the winnings of $104.50. It seems I must play through my deposit once before I am eligble to withdraw it. I am then informed that my payment will be processed in 7 to 10 working days. Now, in the sites defence I must point out that they pay all the bank charges relating to the transactions so it is not unreasonable to ask for some action in return. I just wish that tell would people upfront what their rules are.